This post highlights an innovative tool for crop pest control eLocust3, a highly effective data recording and transmission system for crop pest monitoring developed by the FAO of the UN. “The Desert Locust is considered the world’s most dangerous migratory pest species. It threatens people’s livelihoods, food security, the environment and economic development. A single outbreak can affect as many as 65 of the world’s poorest countries, and up to 20 percent of the Earth’s land mass” (eLocust3. Good practice fact sheet, FAO). “eLocust data represents the foundation of FAO's Desert Locust early warning system - the oldest migratory pest monitoring and early warning system in the world. The data are used for assessing the current situation, forecasting its developments and planning an effective response at all levels” (Climate Change and Desert Locust. An overview of analytical tools, FAO). In 2012, the Desert Locust Information Service (DLIS) at FAO started developing eLocust3 tool - a highly effective recording and transmission (in real time via satellite) system of geo-referenced data for crop pest monitoring. The eLocust3 has been operational since 2014. Before eLocust3 could be distributed to locust-affected countries, each unit was preconfigured by AGPMM/DLIS at FAO. 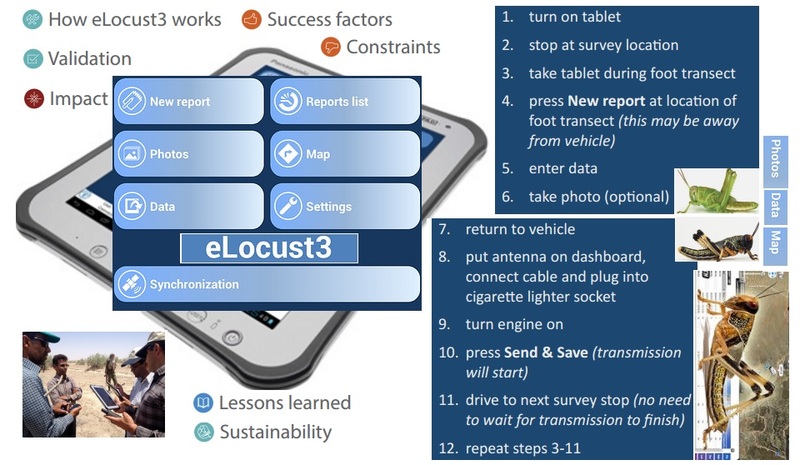 eLocust3 technology is currently being used with considerable success as a detection and early warning tool for the global Desert Locusts monitoring. Data recorded and transmitted by means of the eLocust3 are used to assess the current situation, forecast its developments and warn locust-affected countries and the international donor community of locust invasions and plagues. In particular, the eLocust3 application allows users to take photos at the location of the survey or control operation that are automatically geo-referenced and can be accessible on the Internet. Photos of habitat conditions and locust infestations are a very good method of supplementing field observations and data. The eLocust3 system improves the quality and completeness of data recorded and transmitted by the tablet. This is done through a complex set of logic checks and mandatory data fields that must be realized before data can actually be transmitted by satellite. DLIS developed self-training materials such as videos, presentations, slideshows and fact sheets distributed through social media (YouTube, Slideshare, Facebook). FAO DLIS would like to ensure further sustainability of the global early warning system by migrating all custom applications and GIS to open standard, open-source LocustGIS4D and to take full advantage of NASA’s World Wind technology. the eLocust3 adaptation and replication to monitor other crops pests, both migratory and sedentary.